Audeze LCD-3 review | What Hi-Fi? Can any headphones be worth £1725? It’s a question we found ourselves asking more than once when reviewing Audeze’s (pronounced Odyssey) LCD-3. By the end of the test period we had our answer, and it’s firmly in the positive. Provided the source and amplifier are up to the job these ’phones deliver a scale and authority of sound we just didn’t think headphones could ever manage. The first hint of greatness is apparent straight from the off. We started with Beethoven’s lovely Moonlight Sonata (otherwise known as Piano Sonata No.14), and were treated to a rich, vibrant sound that lacked for nothing in resolution or dynamic subtlety. The amount of insight on offer is astounding, from the LCD-3s’ convincing rendering of the layered harmonics of a piano to their ability to convey the low-level details that define the size and acoustic of the hall the piece was recorded in. We were also struck by the solidity of the presentation. There’s a believable feeling of physical presence to the sound of the instrument; a quality that eludes even the best of rivals such as the similarly priced Grado PS1000s. 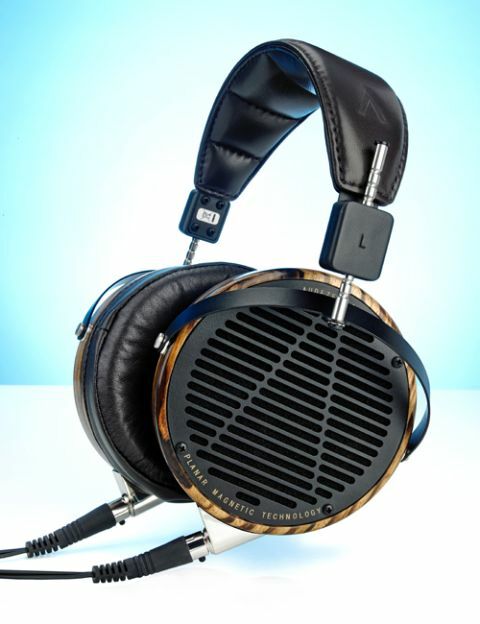 Move onto Before Your Very Eyes from Atoms For Peace and the LCD-3s are happy to move up the gears. Here, they charge along, keeping a firm grip on the intricate rhythms and delivering a full dose of the music’s momentum. It’s also here we notice the Audezes’ low-frequency performance. It’s terrific; there’s plenty of weight (no doubt contributing to the overall sense of solidity and authority we hear) and the kind of articulation that rarely goes with serious bass extension. Balance is the key to most top-class products, and the LCD-3s show class leading skill to deliver plenty of attack without sacrificing refinement. If the music demands – Blur’s Song 2 is a great example – these headphones are more than happy to bite. This level of performance requires a top-quality source and headphone amplifier. We used our Naim NDS/555PS streamer as the main source along with our MacBook as back-up. We used the Naim DAC-V1 as well as the talented Beyerdynamic 1 headphone amplifier to drive the headphones. The Audezes are right at home with such electronics, but such is their resolution we’re sure the benefits of even more ambitious headphone amplifiers would be clear. Take the earpieces apart (if you’re brave) and you’ll find planer magnetic drive units. A conventional drive unit consists of three main parts – a diaphragm, voice coil and motor assembly (which includes the magnet). In the Audezes, the voice coil is printed on a flat diaphragm, so reducing mass and mechanical complexity. This diaphragm sits between an array of magnets and so is driven across its entire surface as the music signal flows through the voice coil. This approach reduces distortion and improves resolution compared with conventional driver technology. As expected, the LCD-3s’ build quality is lovely. These ’phones have a retro feel, yet there’s no denying the quality of the materials used or the company’s attention to detail. The earcups use nicely crafted Zebrano wood, while the earpads are covered with beautifully soft lambskin. It’s a world away from the plastic-and-more-plastic approach of many cheaper headphones. These are large headphones but just stay on the right side of acceptable as far as weight is concerned (548g), and the earpads are nicely judged when it comes to inward pressure, size and cushioning. They’re slightly angled to fit as comfortably as possible on your head, and for most of our reviews it works well. The headband is decently wide and well padded, which helps the fit no end. In most ways these are the kind of headphones we could wear for hours, though our ears did warm up a little too much as the listening sessions went on. The LCD-3s use an open-backed design. This means they leak sound into the room. A lot. So they’re not really ideal when you’re sitting in the same room as someone else, unless you don’t mind annoying them. These things apart, there’s little to complain about here. While the price may understandably be a big stumbling block for many, it’s worth considering that it would take tens of thousands of pounds to buy a pair of speakers that can even approach the LCD-3s’ level of sound quality. Even then, the chances are that you’ll have to spend more to optimise your room to get this level of performance. Looked at in that way these Audezes almost seem like good value. Almost.